Daryl Murphy’s time wearing the Garibaldi Red may have come to an end - and he shouldn’t be in next season’s plans. The 35-year-old only joined Forest in last summer’s transfer window but his performance against Bristol City on Saturday afternoon was enough to convince the City Ground he is simply not good enough for the team. It’s not the lack of goals the striker has struggled to net this season but the lacklustre performances that often seem like Forest only have 10 men on the field. Murphy started the season strong, netting six goals in 11 appearances, but since autumn he has faded in and out of the side and the goals have dried up. It may be difficult to sell or even loan Murphy out for next season because of his age and goal scoring record for this campaign so a contract termination may be needed. Aitor Karanka proved in the January transfer window that he is not afraid to terminate contracts of those who are not worthy to wear the shirt and Murphy falls into the same category. Murphy was brought in from Newcastle United in the summer for £2,000,000 so only a year’s worth of service and terminated contract may have been a major waste of money but clearing out the dead wood and sending out a clear message would make it worthwhile. Murphy was given a rare opportunity in the starting line-up on Saturday’s home game against Bristol City and during most of the 90 minutes it was as though he was not on the pitch. This was the striker’s opportunity to show what he can bring to side and why he should be classed as a key player for next season but instead he slugged around the pitch and failed to win headers. 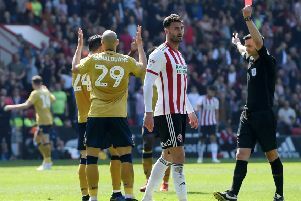 It may have been unfair to start Murphy ahead of both Ben Brereton and Apostolos Vellios as they both netted in the previous game before but as the Reds had nothing to play for Murphy was granted one last chance to prove himself. Murphy has struggled to cement himself into the Forest side since Karanka took over in January, and minutes have been hard to come by, but Saturday’s performance proved that the side haven’t been missing out on much. Despite standing at an impressive 6ft 3in the forward made limp attempts at winning the ball in the air and rarely chased down it when it was being passed across the opposition’s backline. Although Brereton’s goal scoring record doesn’t outshine Murphy’s for this season, his passion and work rate does. Brereton seems like a player that clearly wants to be at the club and is willing to give everything he can on the field to the side, but the same cannot be said about Murphy. The club needs to keep and reward the players that give their all not the ones that don’t. Karanka needs to also recruitment at least two more proven reliable strikers in the summer to help the side overcome their goal drought and fire them up the opposite end of the table that they are not as familiar with. The owners proved last summer that they are willing to spend the money on new recruits as they did on Murphy but this time it’s down to Karanka to make sure he spends it on the correct players.